A team of scientists have made an exciting discovery and dug up a huge elephant tusk in Saudi Arabia that's 300,000 years old. They discovered it under sand beside a dried up ancient lake, suggesting that the scorching hot deserts there, once used to be covered in lush grassy land, where large animals roamed. 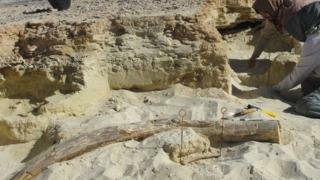 Scientists think the tusk belonged to an extinct species of the elephant from the Pleistocene era, known as Palaeoloxodon. Watch the clip to hear BBC's Frank Gardner explain more.